Just when you thought it doesn't get any easier for the Stars, they begin their four games in five nights road trip on Friday the 13th. Skeeeery. This will be the fourth and final time the Stars and Ice meet this season. Lincoln leads the season series, two games to one. 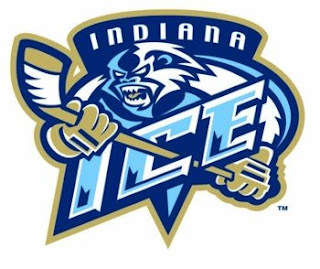 Lincoln won home games against the Ice on 11/14/08 and 1/3/09, and have lost the one road game they played in Indiana on 12/13/08. Lincoln forward Ryan Kretzer has an impressive 6 goals and 2 assists in three games against the Ice this season. Lincoln goaltender Kevin Murdock is 2-0 against the Ice, while sporting a .950 save percentage and a 1.50 goals against average. Considering the play of Doc against the Ice this season, and Anthony Borelli's recent struggles against the Omaha Lancers, I expect Doc to start in this game. However, with my recent track record of predictions...anything is possible. The Stars have played quite well against the Ice this season, so there is hope that the players will put together a complete game. With how bad the team played this past Tuesday against Omaha, I really expect the Stars to come out guns blazing in this game. I'm sure Coach McGroarty hammered on them in practice during this short week, so I would think the players are VERY eager to get back on the ice and show that they are better than what they have recently shown. Indiana will be a little different team to face this time around, as the Ice stole acquired forward Mike Cichy from the Tri-City Storm back in January. Cichy is the real deal, folks. The Ice were a very good offensive team before, and now they're even better. Cichy has accumulated 33 points in 20 games with the Ice since the trade. Forwards Stanislav Galiev and Brandon Richardson are two other Indiana forwards that the Stars will have to keep tabs on throughout this game. I really hope we see the Stars put together a whole 60 minutes, even if they come up short and lose the game. Obviously a win would be nice, but a consistent, physical, "in your face" effort for the entire 60 minutes is more important right now, in my opinion. Go Stars. An important reminder...this game will start at 6:30pm Central time. Sounds like Hill will be in the lineup. Hallelujah. He needs to jump-start Kretz and Alexander also...those two have been MIA as of late. Big game tonight. GO STARS. Stars lose 1-0. I'll write up a postgame report tonight. Bleah.